Check out my interview on bSmartGuide.com! 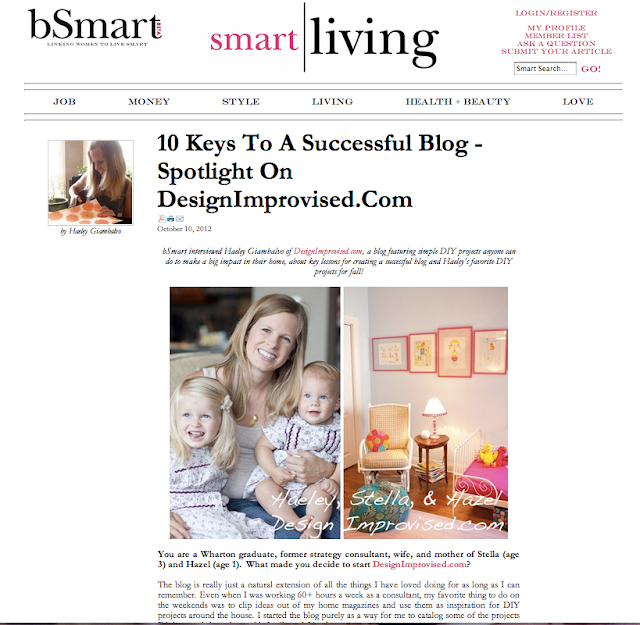 I was recently interviewed by the website bSmartGuide, with questions ranging from how my background in management consulting has helped my blogging, to which of my DIY projects has been my husband Ross’s favorite! I really enjoyed the interview and being able to contribute to bSmart, which is a site I think women between the ages of 20-35 (or so) would particularly appreciate. The site serves as a social marketplace that links women together to ask questions, exchange ideas, and share advice on living fuller, richer, and smarter lives. Is There a Difference Being a Woman in the Workplace? I hope you have a chance to check out my interview and the other great articles on bSmart Guide!